The United States and Canada rank first and second as the largest consumers of prescription opioids, with a reported 203% increase in usage between 2000 and 2010. Tragically, drug overdose has become the leading cause of accidental death in the United States, with 52,404 lethal cases in 2015. Canada is close behind, with roughly 47,000 deaths annually linked to substance abuse. 1Rudd RA, Seth P, David F, Scholl L. Increases in Drug and Opioid-Involved Overdose Deaths — United States, 2010–2015. MMWR Morb Mortal Wkly Rep 2016;65:1445- 52. DOI: http://dx.doi.org/10.15585/mmwr.mm655051e1.,22016 Health Officer’s Council of British Columbia, Canada. As healthcare professionals, we have a duty to be vigilant when offering patients prescriptions for opioid medications to help manage dental pain. This paper discusses the use of non-opioid analgesics as an effective and safe treatment option. For many years, combination analgesic products have been used for treating moderate to severe dental pain. 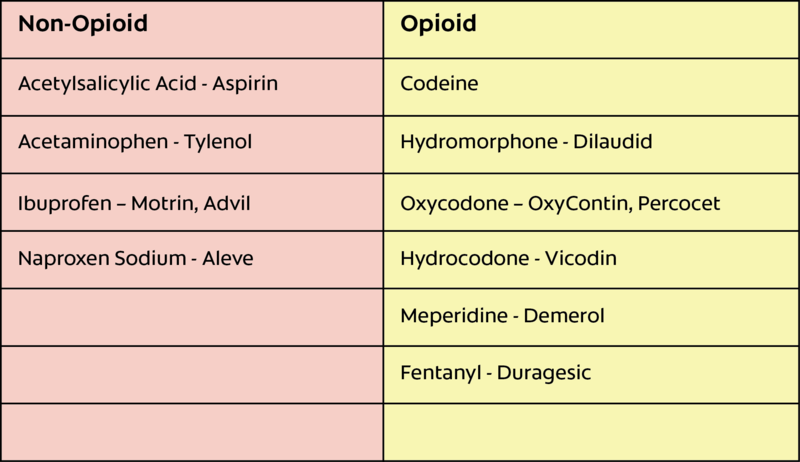 Formulations containing an opioid analgesic, such as oxycodone, and a non-opioid analgesic, such as acetaminophen, are widely used in dentistry and have demonstrated greater efficacy in providing pain relief than either ingredient used individually. 3Gaskell H, Derry S, Moore RA, McQuay HJ. Single dose oral oxycodone and oxycodone plus paracetamol (acetaminophen) for acute postoperative pain in adults. Cochrane Database Syst Rev 2009;(3):CD002763. However, since opioid analgesics may increase the risk of adverse effects, such as central nervous system depression, respiratory depression, and gastrointestinal upset, combination analgesics containing only non-opioid ingredients are attractive alternatives (Table 1). Non-opioid analgesics useful in the treatment of dental pain include acetaminophen and non-steroidal anti-inflammatory drugs (NSAIDs). Some patients may believe that because these agents are available without a prescription, they are inferior in their ability to relieve dental pain. However, research has concluded that the opposite is true, 4Toms L, McQuay HJ, Derry S, Moore RA. Single dose oral paracetamol (acetaminophen) for postoperative pain in adults. Cochrane Database Syst Rev 2008;8(4):CD004602.,5Derry C, Derry S, Moore RA, McQuay HJ. Single dose oral ibuprofen for acute post-operative pain in adults. Cochrane Database Syst Rev 2009;8(3):CD001548.,6Weil K, Hooper L, Afzal Z, et al. Paracetamol for pain relief after surgical removal of lower wisdom teeth. Cochrane Database Syst Rev 2007;18(3):CD004487. and many recent studies have demonstrated the potential advantages of a product which combines these ingredients. 7Skoglund JA, Skjelbred P, Fyllingen G. Analgesic efficacy of acetaminophen 1000 mg, acetaminophen 2000 mg, and the combination of acetaminophen 1000 mg and codeine phosphate 60 mg versus placebo in acute postoperative pain. Pharmacotherapy 1991;11(5):364-9.,8Ong CK, Seymour RA, Lirk P, Merry AF. Combining paracetamol (acetaminophen) with nonsteroidal anti-inflammatory drugs: a qualitative systematic review of analgesic efficacy for acute postoperative pain. Anesth Analg 2010;110(4):1170-9.,9Mehlisch DR, Aspley S, Daniels SE, Bandy DP. Comparison of the analgesic efficacy of concurrent ibuprofen and paracetamol with ibuprofen or paracetamol alone in the management of moderate to severe acute postoperative dental pain in adolescents and adults: a randomized, double-blind, placebo-controlled, parallel-group, single-dose, two-center, modified factorial study. Clin Ther 2010; 32(5):882-95.,10Daniels SE, Goulder MA, Aspley S, Reader S. A randomised, five-parallel-group, placebo-controlled trial comparing the efficacy and tolerability of analgesic combinations including a novel single-tablet combination of ibuprofen/paracetamol for post-operative dental pain. Pain 2011;152(3):632-42. Acetaminophen is often referred to as APAP, an acronym for its chemical name (N-acetyl-p-aminophenol). It is also known as paracetamol in certain countries. It has analgesic and anti-pyretic activity that is equivalent to aspirin, but very weak anti-inflammatory effects when compared with aspirin or NSAIDs. While its exact mechanism of action is not fully understood, it is believed that acetaminophen, like aspirin and the NSAIDs, inhibits prostaglandin synthesis. Acetaminophen appears to be much more active in the central nervous system and may have multiple unknown mechanisms of action. 11Smith HS. Potential analgesic mechanisms of acetaminophen. Pain Physician 2009;12(1):269-80. Acetaminophen is usually the drug of choice for patients with contraindications to the use of aspirin and NSAIDs. Although not a true anti-inflammatory, acetaminophen can be effective in treating pain resulting from inflammation. The most serious adverse effect associated with the use of acetaminophen is drug-induced hepatotoxicity, due to an acute or chronic overdose. When used as monotherapy, acetaminophen has been shown to be an effective analgesic for the relief of post-operative pain, 4 and at a 1000 mg dose proved in one study to be superior to placebo in reducing pain after extraction of third molars. 5Derry C, Derry S, Moore RA, McQuay HJ. Single dose oral ibuprofen for acute post-operative pain in adults. Cochrane Database Syst Rev 2009;8(3):CD001548. However, readers should be aware that in cases of moderate to severe postoperative pain resulting from other dental procedures, acetaminophen’s analgesic effect is limited, especially at high doses. 6Weil K, Hooper L, Afzal Z, et al. Paracetamol for pain relief after surgical removal of lower wisdom teeth. Cochrane Database Syst Rev 2007;18(3):CD004487. Because it produces few side effects at usual adult doses, acetaminophen has long been considered a safe analgesic. Nevertheless, it has been shown that at high doses acetaminophen may interact with warfarin, resulting in a significantly higher INR (a measure used to determine the clotting tendency of blood) and raising the risk of longer bleeding times. 12Parra D, Beckey NP, Stevens GR. The effect of acetaminophen on the international normalized ratio in patients stabilized on warfarin therapy. Pharmacotherapy 2007;27(5):675-83 In addition, while it is known that acetaminophen may cause acute liver toxicity in supra-therapeutic doses, it has been shown that even high therapeutic doses of acetaminophen may still result in sub-clinical liver injury. 13Daly FF, O’Malley GF, Heard K, Bogdan GM, Dart RC. Prospective evaluation of repeated supratherapeutic acetaminophen (paracetamol) ingestion. Ann Emerg Med 2004;44(4):393-8.,14Arundel C, Lewis JH. Drug-induced liver disease in 2006. Curr Opin Gastronterol 2007;23(3):244-54. Accordingly, acetaminophen’s analgesic effect would be optimized and its potential for producing adverse reactions and drug interactions would be minimized, if it were used either in lower doses or perhaps combined with another analgesic, such as an NSAID. 15Altman RD. A rationale for combining acetaminophen and NSAIDs for mild-to-moderate pain. Clin Exp Rheumatol 2004;22(1):110-7. Such a combination would improve analgesic efficacy without increasing the risk of adverse drug reactions. NSAIDs are among the world’s most commonly used pain relievers. NSAIDs inhibit the formation of cyclooxygenase-2 (COX-II), the enzyme responsible for the production of harmful prostaglandins which produce pain, fever, and inflammation. However, NSAIDs also inhibit the formation of cyclooxygenase-1 (COX-I), the enzyme responsible for the production of beneficial prostaglandins that produce gastrointestinal mucous lining, regulate normal platelet activity, maintain adequate blood flow to the kidneys, and regulate bronchodilation. Since the therapeutic and adverse effects of NSAIDs are also dose related, the use of lower doses in a combination analgesic product is considered advantageous. 16Mehlisch DR, Aspley S, Daniels SE, Southerden KA, Christensen KS. A single-tablet fixed-dose combination of racemic ibuprofen/paracetamol in the management of moderate to severe postoperative dental pain in adult and adolescent patients: a multicenter, two-stage, randomized, double-blind, parallel-group, placebo-controlled, factorial study. Clin Ther 2010;32(6):1033-49.,17Dionne R. Additive analgesia without opioid side effects. Compend Contin Educ Dent 2000;21:572-76. There is no definitive evidence that one NSAID is superior to another in its ability to relieve dental pain. Studies have demonstrated the efficacy of several NSAIDs in reducing pain after dental surgery, when compared with acetaminophen and acetaminophen with codeine. 18Mehlisch DR, Frakes L, Cavaliere MB, Gelman M. Double-blind parallel comparison of single oral doses of ketoprofen, codeine, and placebo in patients with moderate to severe dental pain. J Clin Pharmacol 1984;24(11-12):486-92.,19Mehlisch DR, Jasper RD, Brown P, Korn SH, McCarroll K, Murakami AA. Comparative study of ibuprofen lysine and acetaminophen in patients with postoperative dental pain. Clin Ther 1995;17(5):852-60. However, there is considerable data indicating that ibuprofen, one of the most common NSAIDs, when given at 200 mg and 400 mg doses is effective in relieving post-operative dental pain. 5Derry C, Derry S, Moore RA, McQuay HJ. Single dose oral ibuprofen for acute post-operative pain in adults. Cochrane Database Syst Rev 2009;8(3):CD001548. Several comparative studies found that ibuprofen provided greater pain relief in patients with moderate to severe post-operative dental pain and with similar adverse effects to placebo. 5Derry C, Derry S, Moore RA, McQuay HJ. Single dose oral ibuprofen for acute post-operative pain in adults. Cochrane Database Syst Rev 2009;8(3):CD001548. Monotherapy with ibuprofen has been shown to be equal to or superior to monotherapy with acetaminophen in the management of dental pain. 5 However, because monotherapy may provide incomplete pain relief, combinations of these two analgesics are often studied. 20Mehlisch DR, Sollecito WA, Helfrick JF, et al. Multicenter clinical trial of ibuprofen and acetaminophen in the treatment of postoperative dental pain. J Am Dent Assoc 1990;121(2):257-63. Acetaminophen and ibuprofen have slightly different mechanisms of action, and a combination of the two agents may offer a synergistic approach to pain relief. 15Altman RD. A rationale for combining acetaminophen and NSAIDs for mild-to-moderate pain. Clin Exp Rheumatol 2004;22(1):110-7. Concurrent ibuprofen and acetaminophen appeared to provide significantly better analgesic efficacy compared with the same drugs taken separately for acute post-operative dental pain in adolescents and adults. 7Skoglund JA, Skjelbred P, Fyllingen G. Analgesic efficacy of acetaminophen 1000 mg, acetaminophen 2000 mg, and the combination of acetaminophen 1000 mg and codeine phosphate 60 mg versus placebo in acute postoperative pain. Pharmacotherapy 1991;11(5):364-9. A single-tablet combination of ibuprofen 200 mg/acetaminophen 500 mg provided highly effective analgesia that was comparable with, or superior to, other combination analgesics currently indicated for strong pain. 16Mehlisch DR, Aspley S, Daniels SE, Southerden KA, Christensen KS. A single-tablet fixed-dose combination of racemic ibuprofen/paracetamol in the management of moderate to severe postoperative dental pain in adult and adolescent patients: a multicenter, two-stage, randomized, double-blind, parallel-group, placebo-controlled, factorial study. Clin Ther 2010;32(6):1033-49. Ibuprofen 200 mg/acetaminophen 500 mg and ibuprofen 400 mg/acetaminophen1000 mg were significantly more effective than comparable doses of ibuprofen or acetaminophen alone in moderate to severe acute dental pain, and were significantly superior to placebo in providing sustained pain relief. 9Mehlisch DR, Aspley S, Daniels SE, Bandy DP. Comparison of the analgesic efficacy of concurrent ibuprofen and paracetamol with ibuprofen or paracetamol alone in the management of moderate to severe acute postoperative dental pain in adolescents and adults: a randomized, double-blind, placebo-controlled, parallel-group, single-dose, two-center, modified factorial study. Clin Ther 2010; 32(5):882-95. Several non-prescription combination analgesics contain caffeine. Caffeine is not thought to possess any analgesic properties on its own; it is combined with traditional analgesics such as acetaminophen, ibuprofen, and aspirin, in the belief that it enhances analgesic efficacy. Studies have demonstrated that adding caffeine to these analgesics provides an increase in the number of patients who experienced good pain relief. 21Derry CJ, Derry S, Moore RA. Caffeine as an analgesic adjuvant for acute pain in adults. Cochrane Database Syst Rev 2012;3:CD009281. As a result, a combination analgesic containing acetaminophen and ibuprofen may well contain caffeine as an adjunct. Combination acetaminophen and ibuprofen products are not without risks. It has been reported that among elderly patients requiring analgesic/anti-inflammatory treatment, use of the combination of an acetaminophen and an NSAID increased the risk of GI bleeding compared with either agent alone. 22Rahme E, Barkun A, Nedjar H, Gaugris S, Watson D. Hospitalizations for upper and lower GI events associated with traditional NSAIDs and acetaminophen among the elderly in Quebec, Canada. Am J Gastroenterol 2008 Apr;103(4):872-82. Also, a recent warning by the FDA notified healthcare professionals and patients that acetaminophen has been associated with a risk of two rare but serious skin reactions: Stevens-Johnson Syndrome (SJS) and toxic epidermal necrolysis (TEN). 23U.S. Food and Drug Administration. FDA warns of rare but serious skin reactions with the pain reliever/fever reducer acetaminophen. Available at http://www.fda.gov/Drugs/ DrugSafety/ucm363041.htm Last accessed August 11, 2013. The use of NSAIDs such as ibuprofen has also been associated with the risk of these conditions. 24Kasemsarn P, Kulthanan K, Tuchinda P, Dhana N, Jongjarearnprasert K. Cutaneous reactions to non-steroidal anti-inflammatory drugs. J Drugs Dermatol 2011 Oct;10(10):1160-7. A product which combines both of these ingredients may theoretically increase this risk. Combining two analgesic agents with similar, but still different, mechanisms of action may offer a synergistic approach to providing dental pain relief, while minimizing adverse effects. As described above, recent research has consistently demonstrated that a combination analgesic containing acetaminophen and ibuprofen was more effective in treating dental pain than when the individual ingredients were administered separately. As healthcare professionals, we must remain aware of the risks –addiction, abuse, and overdose – posed by over-prescribing opioid analgesics. Evidence presented in this paper underlines the fact that managing post-operative pain, while certainly an everyday challenge in clinical practice, may be achievable without first reaching for a prescription pad. A stepwise approach, perhaps with opioids as the last option, is worthy of consideration. 1.Rudd RA, Seth P, David F, Scholl L. Increases in Drug and Opioid-Involved Overdose Deaths — United States, 2010–2015. MMWR Morb Mortal Wkly Rep 2016;65:1445- 52. DOI: http://dx.doi.org/10.15585/mmwr.mm655051e1. 2.2016 Health Officer’s Council of British Columbia, Canada. 3.Gaskell H, Derry S, Moore RA, McQuay HJ. Single dose oral oxycodone and oxycodone plus paracetamol (acetaminophen) for acute postoperative pain in adults. Cochrane Database Syst Rev 2009;(3):CD002763. 4.Toms L, McQuay HJ, Derry S, Moore RA. Single dose oral paracetamol (acetaminophen) for postoperative pain in adults. Cochrane Database Syst Rev 2008;8(4):CD004602. 5.Derry C, Derry S, Moore RA, McQuay HJ. Single dose oral ibuprofen for acute post-operative pain in adults. Cochrane Database Syst Rev 2009;8(3):CD001548. 6.Weil K, Hooper L, Afzal Z, et al. Paracetamol for pain relief after surgical removal of lower wisdom teeth. Cochrane Database Syst Rev 2007;18(3):CD004487. 7.Skoglund JA, Skjelbred P, Fyllingen G. Analgesic efficacy of acetaminophen 1000 mg, acetaminophen 2000 mg, and the combination of acetaminophen 1000 mg and codeine phosphate 60 mg versus placebo in acute postoperative pain. Pharmacotherapy 1991;11(5):364-9. 8.Ong CK, Seymour RA, Lirk P, Merry AF. Combining paracetamol (acetaminophen) with nonsteroidal anti-inflammatory drugs: a qualitative systematic review of analgesic efficacy for acute postoperative pain. Anesth Analg 2010;110(4):1170-9. 9.Mehlisch DR, Aspley S, Daniels SE, Bandy DP. Comparison of the analgesic efficacy of concurrent ibuprofen and paracetamol with ibuprofen or paracetamol alone in the management of moderate to severe acute postoperative dental pain in adolescents and adults: a randomized, double-blind, placebo-controlled, parallel-group, single-dose, two-center, modified factorial study. Clin Ther 2010; 32(5):882-95. 10.Daniels SE, Goulder MA, Aspley S, Reader S. A randomised, five-parallel-group, placebo-controlled trial comparing the efficacy and tolerability of analgesic combinations including a novel single-tablet combination of ibuprofen/paracetamol for post-operative dental pain. Pain 2011;152(3):632-42. 11.Smith HS. Potential analgesic mechanisms of acetaminophen. Pain Physician 2009;12(1):269-80. 13.Daly FF, O’Malley GF, Heard K, Bogdan GM, Dart RC. Prospective evaluation of repeated supratherapeutic acetaminophen (paracetamol) ingestion. Ann Emerg Med 2004;44(4):393-8. 14.Arundel C, Lewis JH. Drug-induced liver disease in 2006. Curr Opin Gastronterol 2007;23(3):244-54. 15.Altman RD. A rationale for combining acetaminophen and NSAIDs for mild-to-moderate pain. Clin Exp Rheumatol 2004;22(1):110-7. 16.Mehlisch DR, Aspley S, Daniels SE, Southerden KA, Christensen KS. A single-tablet fixed-dose combination of racemic ibuprofen/paracetamol in the management of moderate to severe postoperative dental pain in adult and adolescent patients: a multicenter, two-stage, randomized, double-blind, parallel-group, placebo-controlled, factorial study. Clin Ther 2010;32(6):1033-49. 17.Dionne R. Additive analgesia without opioid side effects. Compend Contin Educ Dent 2000;21:572-76. 18.Mehlisch DR, Frakes L, Cavaliere MB, Gelman M. Double-blind parallel comparison of single oral doses of ketoprofen, codeine, and placebo in patients with moderate to severe dental pain. J Clin Pharmacol 1984;24(11-12):486-92. 19.Mehlisch DR, Jasper RD, Brown P, Korn SH, McCarroll K, Murakami AA. Comparative study of ibuprofen lysine and acetaminophen in patients with postoperative dental pain. Clin Ther 1995;17(5):852-60. 20.Mehlisch DR, Sollecito WA, Helfrick JF, et al. Multicenter clinical trial of ibuprofen and acetaminophen in the treatment of postoperative dental pain. J Am Dent Assoc 1990;121(2):257-63. 21.Derry CJ, Derry S, Moore RA. Caffeine as an analgesic adjuvant for acute pain in adults. Cochrane Database Syst Rev 2012;3:CD009281. 22.Rahme E, Barkun A, Nedjar H, Gaugris S, Watson D. Hospitalizations for upper and lower GI events associated with traditional NSAIDs and acetaminophen among the elderly in Quebec, Canada. Am J Gastroenterol 2008 Apr;103(4):872-82. 23.U.S. Food and Drug Administration. FDA warns of rare but serious skin reactions with the pain reliever/fever reducer acetaminophen. Available at http://www.fda.gov/Drugs/ DrugSafety/ucm363041.htm Last accessed August 11, 2013. 24.Kasemsarn P, Kulthanan K, Tuchinda P, Dhana N, Jongjarearnprasert K. Cutaneous reactions to non-steroidal anti-inflammatory drugs. J Drugs Dermatol 2011 Oct;10(10):1160-7.